We sometimes complain about miscellany programmes where there is no link or perhaps only a tenuous nexus. There can be no such complaint here with a well-proportioned and rigorously-arranged sequence linked by Spring, the English nationality of the three composers, musical style to some extent and by the origins of the music in the 1910s and 1920s. This brilliantly orchestrated world, all dewy and luxuriant undergrowth, is first evoked through a memorable drip-tick ostinato spun with wispy tendrils and birdsong. Not for the last time you might think of Ravel’s Daphnis. The images are in part those of a classical Mediterranean never-never land. Bantock’s much later Pagan Symphony has the same mise-en-scène but Bax’s work is expressed through more diaphanous textures. It’s all greenswards peopled with fauns, nymphs and satyrs. The effects are breathtakingly beautiful with listeners perhaps recalling the Presentation of the Rose (Rosenkavalier) as well as Miaskovsky Symphony 13 and 14 in the fourth movement and Rimsky’s Russian Easter Festival in the finale. The languorous spell cast by this discursive music is full of wood magic but is by no means entirely sleepy. The whooping triton horns of the last movement recall the lusty tidal race of Bax’s own Fourth Symphony with its glittering waves and dazzling amethyst–green combers. Overall though this work leans more towards the sensuous pictorial Bax of the Third Symphony, Tintagel, Nympholept, The Happy Forest and Fand than the Nordic Bax of the Fifth Symphony and Winter Legends. Elder has known this score for at least a decade. I recall going to the Proms in July 1996 and seeing him give one of his earliest accounts. Before that the performance history of this Henry Wood-dedicated work – in some ways Bax’s Symphony No. 0 (though there is also a 00, I believe) – began in “recent times” with Leslie Head’s Kensington Symphony Orchestra on 8 December 1970. Then, after a long pause, Norman Del Mar and the BBCSO in October 1983 and October 1984 around the Bax Centenary; 1983 was a transformational year though concert performances remain rare birds. Two years later came the only other recording - which still sounds very good – from Handley (Chandos CHAN 8464). Andrew Davis has also conducted the piece. 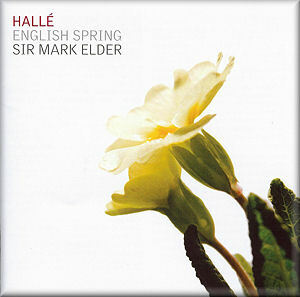 This Halle Spring Fire recording was taken down at a concert and some applause has been included. The other recordings on this disc were made in a studio. Frank Bridge’s music travelled a long way. From the almost Stanfordian Isabella and Piano Quintet to the expressionism and dissonance of the String Quartets 3 and 4 and Piano Trio No. 2. Enter Spring is a work in the midst of a transition but this does not stop it being a confident and towering masterwork of the English Musical Renaissance. A swinging and weighty momentum gradually emerges from whispered intimations. It’s a lucid and succinct construct with a chilly ozone-rich air invigoratingly gusting through its pages. The recording here is of exemplary clarity and the performance is deeply sympathetic. Am not so sure about ripping the Delius Spring movement from the company of the other North Country Sketches but it is well done and its ‘skirl’ reminded me of the “Scotch snap” in Bax’s Northern Ballad No. 1. The Idylle de Printemps is monothematic but what a theme! We know from Sleigh Ride and Hassan that he could write catchy themes – this is another, superbly treated. It reflects the genius of a young man in sophisticated light music. The helpful liner-notes are by Lynne Walker and Calum Macdonald. None of these works is mainstream so although enthusiasts will know many or all of them, others will be able to make impressive discoveries. A great showcase for neglected British rarities from early in the last century. A winner on all counts.